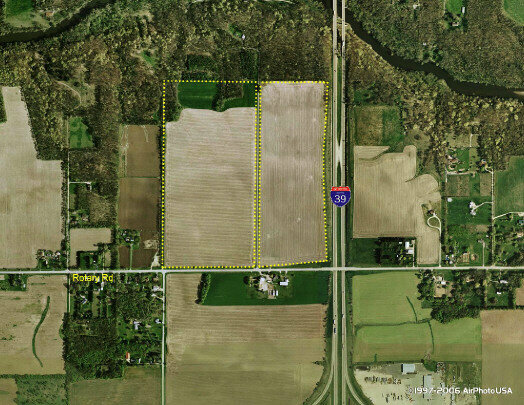 INDUSTRIAL DEVELOPMENT LAND FOR SALE AT$20,000/ACRE. TWO PARCELS: 16-29-100-010 AND 16-29-200-002 DEVELOPER FINALIZING AGREEMENT TO BRING WATER AND SEWER TO SITE INDUSTRIAL TIF. FRONTAGE ON ROTARY ROAD AND FRONTAGE ON I-39. GREAT OPPORTUNITY FOR DEVELOPMENT NEAR BAXTER ROAD, AND ROCK 39 INDUSTRIAL PARK. BROKER INTEREST.